The one thing Crystal Renn knows how to do is make a dramatic entrance on the red carpet, which was very much the case at the American Ballet Theatre 2013 Opening Night Fall Gala held at David Koch Theatre at Lincoln Center in New York City yesterday evening. 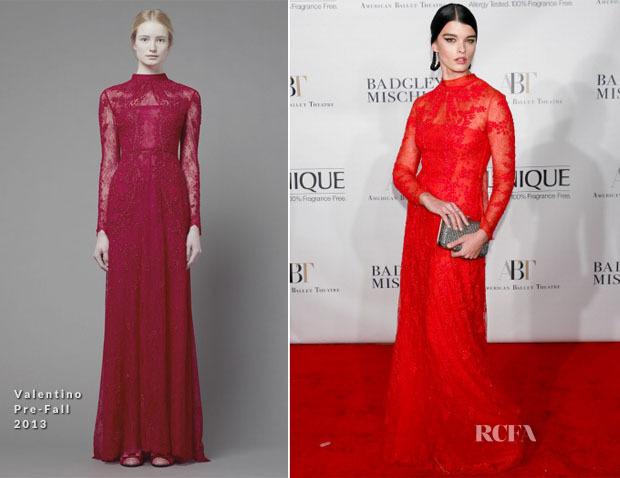 Now this Valentino Pre-Fall red-lace long-sleeve gown with intricate beadwork might be considered tame in comparison to the structural, more complicated Zac Posen gowns she tends to favour, but I’m bowled over by her bold yet minimal look styled with a silver clutch. Dramatic winged eyeliner and shiny black hair in skinny looped braids add to the dramatic nature of this look. 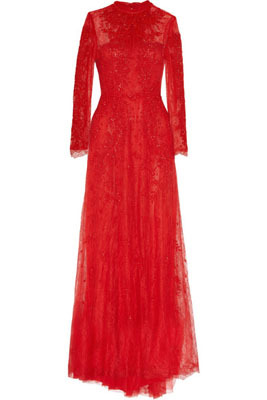 You can buy Crystal’s Valentino Embroidered Lace Gown from Net-A-Porter.com.